A new survey of Montanans' news media preferences is out. "If you compare local to national, local dominates," says John Baldridge, with the University of Montana’s Bureau of Business and Economic Research. He did the survey for the Greater Montana Foundation. 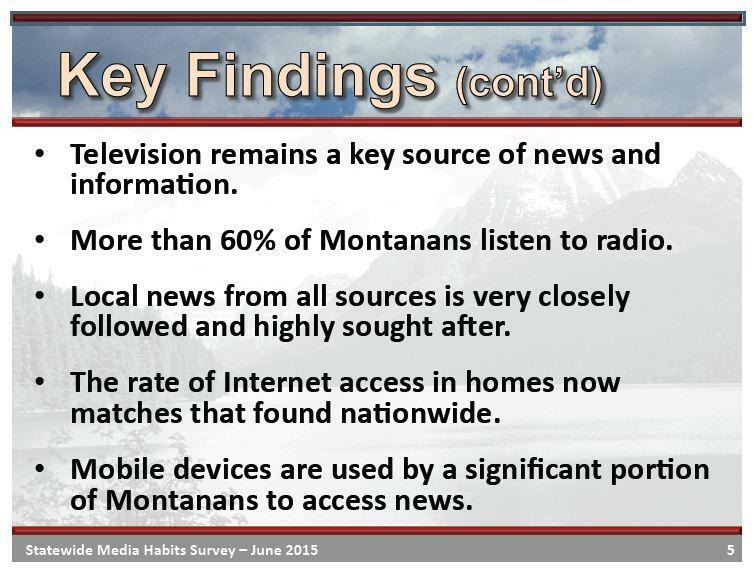 Baldridge says that the representative sample survey shows that Montanans value and seek out local news from a variety of sources, most frequently television and the Internet. 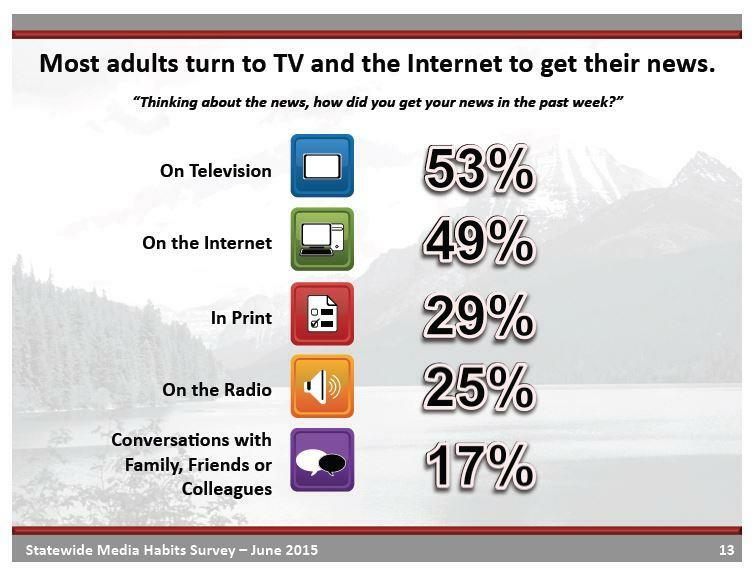 About twice as many said they turn to those sources versus print and radio. The UM BBER survey found Montanans seek out local news from all sources. And about 20 percent more Montanans said they use local sources versus national. "People expressed preferences, pretty strong preferences, for local news," Baldridge says. Only 13 percent of survey respondents said they sometimes or regularly read a national daily newspaper, more than four times as many said they seek out local newspapers or local TV news. Four in ten Montanans are now accessing news on a phone or mobile device every day. The UM BBER survey found that TV and the internet are the most popular sources of news for Montanans. Baldridge says Montanans are increasingly using online devices for news, but not necessarily online sources. "People use a lot of the traditional sources, that is, television, radio, print, to get their news, but they may use tools that are evolving and less traditional, and especially in a growing way, maybe handheld devices in the state." Baldridge’s survey says that more than a quarter of Montanans who use mobile devices to get the news are 65 years old or older. You can see the results of the Montana Issues and News Media Survey here. 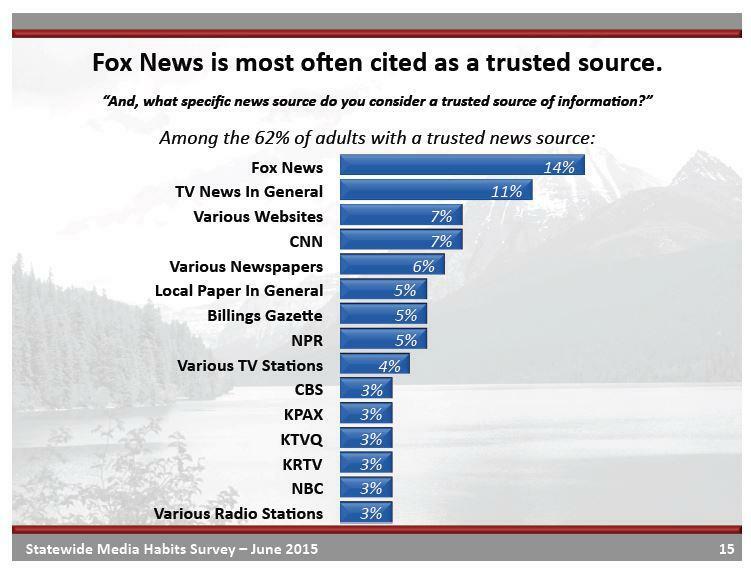 Montanans most often cite Fox News as a trusted source, according to a UM BBER survey.